China, only the third country to independently send a person into space in 2003, after the US and Russia, plans to launch its next manned space mission in June next year, state media reported today. Like in the Shenzhou-9 mission, the crew might include two men astronauts and a woman, who are scheduled to enter the Tiangong-1 space lab module, Niu Hongguang, deputy commander-in-chief of China's manned space programme, said on the sidelines of the 18th National Congress of the Communist Party of China. "They will stay in space for 15 days, operating both automated and manual space dockings with the target orbiter Tiangong-1, conducting scientific experiments in the lab module and giving science lectures to spectators on the Earth," he said. In the coming mission, Shenzhou-10 will offer ferrying services of personnel and supplies for Tiangong-1, further testing the astronauts' abilities of working and living in space, as well as the functions of the lab module, he said. "The success of this mission might enable China to construct a space lab and a space station," he said. Tiangong-1 was sent into space in September 2011. It docked with the Shenzhou-8 unmanned spacecraft last November and the manned Shenzhou-9 in June this year, verifying China's space docking capabilities. Shenzhou-9 carried the first Chinese woman Liu Yang, together with two male crew mates, into outer space. "After more than a year of operation in space, Tiangong-1 is still in good condition," Niu said. "Tiangong-1, with a design life of two years, will likely remain in orbit for further operation after the space docking with Shenzhou-10," he said. The launch rocket and spaceship have been assembled and are being tested, and astronauts are being trained, Niu said. "The selection for the crew will begin in early 2013," he said. 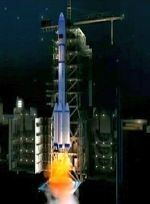 China initiated the manned space programme in 1992. It successfully sent Yang Liwei, the country's first astronaut, into orbit on Shenzhou-5 spacecraft in 2003.